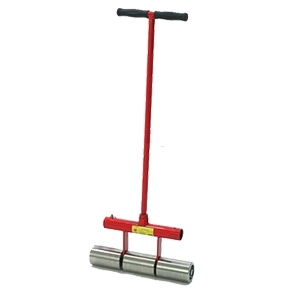 PRODUCT: 35 Lb STAND-UP 16" WIDE STEEL MEMBRANE ROLLER. USED FOR ROLLING (SETTING) ADHERED EPDM / ADHERED ROOFING MEMBRANES, VINYL / LINOLEUM FLOORS ETC. 3 FLOATING POLISHED-STEEL ROLLERS. HEAVY-DUTY CONTRACTOR GRADE CONSTRUCTION. PRICE/EACH. APPLICATIONS: EPDM Roofing Membrane, Vinyl Flooring, Linoleum Floors, Peel/Stick Roofing Membranes, Cold Applied Adhesive Roofing, etc. Helps to evenly distribute and flatten adhesives. Assures fully and evenly adhered membranes.